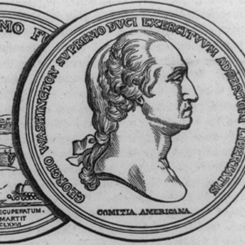 Image courtesy of Library of Congress General George Washington's Congressional Gold Medal depicted the Continental Army's success in removing the British from Boston. On this date, during the 106th Congress (1999–2001), H.R. 3591 was signed into law, awarding President Ronald W. Reagan and First Lady Nancy Reagan the Congressional Gold Medal. The House overwhelmingly approved the legislation in a 350 to 8 vote (75 not voting, 1 present) on April 3, 2000. The legislation provided for “the award of a gold medal on behalf of the Congress to former President Ronald Reagan and his wife Nancy Reagan in recognition of their service to the Nation.” The former First Lady received the award on behalf of her ailing husband on May 16, 2002. The Congressional Gold Medal is a tradition that predates the Federal Congress. In 1776, the Continental Congress bestowed the first medal on General George Washington of Virginia to honor the Continental Army’s success in recapturing Boston from the British during the Revolutionary War. More than 100 gold medals have been presented since the award's inception. While the scope of the award has been broadened over time, Congress has set strict limits for bestowing the award: Two-thirds of both chambers must approve each award.